A recent inquiry held by the Welsh Government into endoscopy services in Wales reveals an alarmingly low number of eligible people take part in bowel screening programmes, and the majority of the country’s health boards breach waiting times for tests that can diagnose bowel cancer. Published today, the resulting report features many of the issues highlighted in our Spotlight on Wales report, published in February 2018. Our Head of Wales, Lowri Griffiths, was invited to submit evidence as part of the one day enquiry. 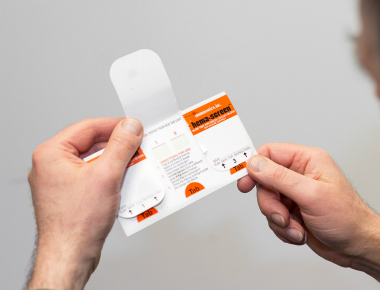 Screening is the best way to diagnose bowel cancer early but between April 2017 and March 2018 only 55.7 per cent of people eligible to take the bowel screening test in Wales actually completed it. Uptake is higher in females (57.2 per cent) compared to males (54.1 per cent). There is also a strong correlation with deprivation – with uptake in the most deprived areas being 45.6 per cent compared to least deprived areas at 63.3 per cent. From 2019, Wales will replace the current screening test with a simpler and more accurate one called the Faecal Immunochemical Test (FIT), which is expected to increase the uptake of screening, but there are concerns that endoscopy units in Welsh hospitals are already struggling to cope with demand, and so even though the new screening test is a positive improvement, it could put more strain on an already overstretched service. While the Committee welcomes the introduction of FIT, it is, however, disappointed that the sensitivity threshold planned within the Bowel Cancer Screening Programme in Wales is lower than that of its UK counterparts. The FIT sensitivity threshold planned within the Bowel Cancer Screening Programme in Wales is 150 micograms of haemoglobin per gram of faeces (μg Hb/g), lower than that in Scotland, where it is 80μg Hb/g. In England, the change is expected to happen in Summer 2019, with a proposed starting sensitivity threshold of 120μg Hb/g. In written evidence, the Welsh Government said that the decision to introduce FIT at a sensitivity of 150 μg Hb/g is based on the associated resource implications for NHS Wales, and is a practical starting point based on existing NHS capacity. The Committee also heard that, despite additional funding from the Welsh Government over recent years, waiting times still give cause for concern. Investment is needed to get waiting times under control, but there also needs to be a more sustainable approach as outsourcing and insourcing is expensive and does not deliver a long-term solution. By October 2019, the Welsh Government should work with the National Endoscopy Improvement Programme to create and publish a national endoscopy action plan that addresses current and future demand for services with clear timescales and targets for improvement. The committee has reported that they will be returning to review progress in twelve months’ time. Lowri Griffiths, Head of Wales for Bowel Cancer UK, says: “We are grateful to the Health Committee for carrying out this short inquiry into endoscopy services in Wales. The urgency with which we need to reorganise diagnostic services for bowel cancer has now reached crisis point. We simply cannot go on as we are. “Bowel cancer is the second biggest cancer killer in Wales and colonoscopy is the gold standard procedure for diagnosing the disease early when treatment has the best chance of success, but we are not doing enough of them. Patients with symptoms of the disease are having to wait too long to get tested and those who have genetic conditions or other high risk factors are sometimes waiting months, or even years, for a surveillance screening colonoscopy. We need a new approach; with innovative training and recruitment solutions for the endoscopy workforce and investment into the rooms and equipment required to achieve the best quality standard that patients deserve.